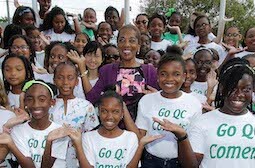 As part of the worlds celebration of International Womens Day, Mrs. Patricia Minnis, Spouse of the Prime Minister, visited and spoke with primary school students of Queen's College, Friday, March 8, 2019. An alum of the school, Mrs. Minnis told the students about efforts being made by the United Nations to equalize the pay of men and women by 2030. Not only can men be cooks and nurses, she noted, but women can become mechanics and chefs.